For other uses, see Qi (disambiguation). In traditional Chinese culture, qì or ch'i ( qì, also known as khí in Vietnamese culture, gi in Korean culture, ki in Japanese culture) is an active principle forming part of any living thing. Qi literally translates as "breath", "air", or "gas", and figuratively as "material energy", "life force", or "energy flow". Qi is the central underlying principle in traditional Chinese medicine and martial arts. Concepts similar to qi can be found in many cultures: prana in Hinduism (and elsewhere in Indian culture), chi in the Igbo religion, pneuma in ancient Greece, mana in Hawaiian culture, lüng in Tibetan Buddhism, manitou in the culture of the indigenous peoples of the Americas, ruah in Jewish culture, and vital energy in Western philosophy. Some elements of the concept of qi can be found in the term energy when used in the context of various esoteric forms of spirituality and alternative medicine. Elements of the concept can also be found in Western popular culture, for example "The Force" in Star Wars and the related Jediism, a religion based on the Jedi and even in Eastern popular culture like Dragon Ball and One-Punch Man. Notions in the West of energeia, élan vital, or vitalism are purported to be similar. Despite widespread belief in the reality of Qi, it is a non-scientific, unverifiable concept. This cultural keyword qì is analyzable in terms of Chinese and Sino-Xenic pronunciations, possible etymologies, the logographs 氣, 气, and 気, various meanings ranging from "vapor" to "anger", and the English loanword qi or ch'i. Pronunciations of 氣 in modern varieties of Chinese, from the infobox (see top right of page) with standardized IPA equivalents, include: Standard Chinese qì /t͡ɕʰi⁵¹/, Wu Chinese qi /t͡ɕʰi³⁴/, Southern Min khì /kʰi²¹/, Eastern Min ké /kʰɛi²¹³/, Standard Cantonese hei3 /hei̯³³/, and Hakka Chinese hi /hi⁵⁵/. Pronunciations of 氣 in Sino-Xenic borrowings include: Japanese language ki, Korean language gi, and Vietnamese language khi. Reconstructions of the Middle Chinese pronunciation of 氣, standardized to IPA transcription, include: /kʰe̯iH/	(Bernard Karlgren), /kʰĭəiH/ (Wang Li), /kʰiəiH/ (Li Rong), /kʰɨjH/ (Edwin Pulleyblank), and /kʰɨiH/ (Zhengzhang Shangfang). Reconstructions of the Old Chinese pronunciation of 氣, standardized to IPA transcription, include: /*kʰɯds/ (Zhengzhang Shangfang), and /*C.qʰəp-s/ (William H. Baxter and Laurent Sagart). The etymology of qì (reconstructed as Middle Chinese kʰjeiC and Old Chinese *kə(t)s) 氣 "air; breath; vapor; vital principle", as well as its cognate kài (MC kʰâiC and OC *khə̂(t)s) 愾 "sigh; angry", interconnects with Kharia kʰis "anger", Sora kissa "move with great effort", Khmer kʰɛs "strive after; endeavor", and Gyalrongic kʰɐs "anger". In East Asian languages, Chinese qì "air; breath" has three logographs: 氣 is the traditional Chinese character, Korean hanja, and Japanese kyūjitai "old character form" kanji; 気 is the Japanese shinjitai "new character form" kanji, and 气 is the simplified Chinese character. In addition, qì 炁 is an uncommon character especially used in writing Daoist talismans. Historically, the word qì was generally written as 气 until the Han dynasty (206 BCE-220 CE), when it was replaced by the 氣 graph clarified with mǐ 米 "rice" indicating "steam (rising from rice as it cooks)". This primary graph 气 corresponds to the earliest written characters for qì, which consisted of three wavy horizontal lines seen in Shang dynasty (c. 1600–1046 BCE) oracle bone script, Zhou dynasty (1046 BCE- 256 BCE) bronzeware script and large seal script, and Qin dynasty (221-206 BCE) small seal script. These oracle, bronze, and seal scripts graphs for qì 气 "air; breath; etc." were anciently used as a phonetic loan character to write qǐ 乞 "plead for; beg; ask", which did not have an early character. The vast majority of Chinese characters are classified as radical-phonetic characters, which combine a semantically suggestive "radical" or "signific" with a "phonetic" element approximating ancient pronunciation. For example, the widely known word dào 道 "the Dao; the way" graphically combines the "walk" radical 辶 with a shǒu 首 "head" phonetic—although the modern dào and shǒu pronunciations are dissimilar, the Old Chinese *lˤuʔ-s 道 and *l̥uʔ-s 首 were alike. The regular script character qì 氣 is unusual because qì 气 is both the "air radical" and the phonetic, with mǐ 米 "rice" semantically indicating "steam; vapor". This qì 气 "air/gas radical", which was only used in a few native Chinese characters like yīnyūn 氤氲 "thick mist/smoke", was used to create new scientific characters for gaseous chemical elements. Some examples are based on pronunciations in European languages: fú 氟 (with a fú 弗 phonetic) "fluorine" and nǎi 氖 (with a nǎi 乃 phonetic) "neon"; others are based on semantics: qīng 氫 (with a jīng 巠 phonetic, abbreviating qīng 輕 "light-weight") "hydrogen (the lightest element)" and lǜ 氯 (with a lù 彔 phonetic, abbreviating lǜ 綠 "green") "(greenish-yellow) chlorine". The first Chinese dictionary of characters, the (121 CE) Shuowen Jiezi notes that the primary qì 气 is a pictographic character depicting 雲气 "cloudy vapors", and that the full 氣 combines 米 "rice" with the phonetic qi 气, meaning 饋客芻米 "present provisions to guests" (later disambiguated as xì 餼). Qi is a polysemous word; the unabridged Chinese-Chinese character dictionary Hanyu Da Zidian lists one meaning "present food or provisions" for the xì pronunciation and 23 meanings for the qì pronunciation. The modern ABC Chinese-English Comprehensive Dictionary, which enters xì 餼 "grain; animal feed; make a present of food" but not classical xì 氣, has a qì 氣 entry giving seven translation equivalents for the noun, two for bound morphemes, and three for the verb. References to concepts analogous to the qi taken to be the life-process or flow of energy that sustains living beings are found in many belief systems, especially in Asia. Philosophical conceptions of qi from the earliest records of Chinese philosophy (5th century BCE) correspond to Western notions of humours, the ancient Hindu yogic concept of prana ("life force" in Sanskrit) and traditional Jewish sources refer to as the Nefesh level of soul within the body. An early form of the idea comes from the writings of the Chinese philosopher Mencius (4th century BCE). Historically, the Huangdi Neijing/"The Yellow Emperor's Classic of Medicine" (circa 2nd century BCE) is credited with first establishing the pathways through which qi circulates in the human body. Traditional Chinese character qì, also used in Korean hanja. In Japanese kanji, this character was used until 1946, when it was changed to 気. The ancient Chinese described it as "life force". They believed qi permeated everything and linked their surroundings together. They likened it to the flow of energy around and through the body, forming a cohesive and functioning unit. By understanding its rhythm and flow they believed they could guide exercises and treatments to provide stability and longevity. Although the concept of qi has been important within many Chinese philosophies, over the centuries the descriptions of qi have varied and have sometimes been in conflict. Until China came into contact with Western scientific and philosophical ideas, they had not categorized all things in terms of matter and energy. Qi and li (理: "pattern") were 'fundamental' categories similar to matter and energy. Fairly early on, some Chinese thinkers began to believe that there were different fractions of qi and that the coarsest and heaviest fractions of qi formed solids, lighter fractions formed liquids, and the most ethereal fractions were the "lifebreath" that animates living beings. Yuán qì is a notion of innate or pre-natal qi to distinguish it from acquired qi that a person may develop over the course of their lifetime. The earliest texts that speak of qi give some indications of how the concept developed. The philosopher Mo Di used the word qi to refer to noxious vapors that would in due time arise from a corpse were it not buried at a sufficient depth. He reported that early civilized humans learned how to live in houses to protect their qi from the moisture that had troubled them when they lived in caves. He also associated maintaining one's qi with providing oneself adequate nutrition. In regard to another kind of qi, he recorded how some people performed a kind of prognostication by observing the qi (clouds) in the sky. In the Analects of Confucius, compiled from the notes of his students sometime after his death in 479 B.C., qi could mean "breath", and combining it with the Chinese word for blood (making 血氣, xue-qi, blood and breath), the concept could be used to account for motivational characteristics. The [morally] noble man guards himself against 3 things. When he is young, his xue-qi has not yet stabilized, so he guards himself against sexual passion. When he reaches his prime, his xue-qi is not easily subdued, so he guards himself against combativeness. When he reaches old age, his xue-qi is already depleted, so he guards himself against acquisitiveness. Mencius described a kind of qi that might be characterized as an individual's vital energies. This qi was necessary to activity and it could be controlled by a well-integrated willpower. When properly nurtured, this qi was said to be capable of extending beyond the human body to reach throughout the universe. It could also be augmented by means of careful exercise of one's moral capacities. On the other hand, the qi of an individual could be degraded by adverse external forces that succeed in operating on that individual. Not only human beings and animals were believed to have qi. Zhuangzi indicated that wind is the qi of the Earth. Moreover, cosmic yin and yang "are the greatest of qi." He described qi as "issuing forth" and creating profound effects. He said "Human beings are born [because of] the accumulation of qi. When it accumulates there is life. When it dissipates there is death... There is one qi that connects and pervades everything in the world." 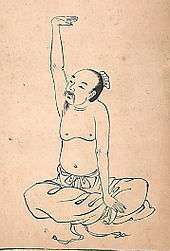 "The Guanzi essay Neiye 內業 (Inward training) is the oldest received writing on the subject of the cultivation of vapor [qi] and meditation techniques. The essay was probably composed at the Jixia Academy in Qi in the late fourth century B.C." Heaven (seen here as the ultimate source of all being) falls (duo 墮, i.e., descends into proto-immanence) as the formless. Fleeting, fluttering, penetrating, amorphous it is, and so it is called the Supreme Luminary. The dao begins in the Void Brightening. The Void Brightening produces the universe (yu-zhou). The universe produces qi. Qi has bounds. The clear, yang [qi] was ethereal and so formed heaven. The heavy, turbid [qi] was congealed and impeded and so formed earth. The conjunction of the clear, yang [qi] was fluid and easy. The conjunction of the heavy, turbid [qi] was strained and difficult. So heaven was formed first and earth was made fast later. The pervading essence (xi-jing) of heaven and earth becomes yin and yang. The concentrated (zhuan) essences of yin and yang become the four seasons. The dispersed (san) essences of the four seasons become the myriad creatures. The hot qi of yang in accumulating produces fire. The essence (jing) of the fire-qi becomes the sun. The cold qi of yin in accumulating produces water. The essence of the water-qi becomes the moon. The essences produced by coitus (yin) of the sun and moon become the stars and celestial markpoints (chen, planets). Traditional Chinese medicine (TCM) asserts that the body has natural patterns of qi that circulate in channels called meridians. In TCM, symptoms of various illnesses are believed to be the product of disrupted, blocked, or unbalanced qi movement through the body's meridians, as well as deficiencies or imbalances of qi in the Zang Fu organs. Traditional Chinese medicine often seeks to relieve these imbalances by adjusting the circulation of qi using a variety of techniques including herbology, food therapy, physical training regimens (qigong, t'ai chi ch'uan, and other martial arts training), moxibustion, tui na, and acupuncture. A qi field (chu-chong) refers to the cultivation of an energy field by a group, typically for healing or other benevolent purposes. A qi field is believed to be produced by visualization and affirmation, and is an important component of Wisdom Healing Qigong (Zhineng Qigong), founded by Grandmaster Ming Pang. Qi is a non-scientific, unverifiable concept. A United States National Institutes of Health consensus statement on acupuncture in 1997 noted that concepts such as qi "are difficult to reconcile with contemporary biomedical information." ...his aura, his qi, his reiki energy. None of these have any counterpart in the physical world. Although she attempted to describe their properties as heat or magnetism, those properties are already taken by - well, heat and magnetism. There are no properties attributable to the mysterious field she describes, thus it cannot be authoritatively said to exist." The traditional Chinese art of geomancy, the placement and arrangement of space called feng shui, is based on calculating the balance of qi, interactions between the five elements, yin and yang, and other factors. The retention or dissipation of qi is believed to affect the health, wealth, energy level, luck and many other aspects of the occupants of the space. Attributes of each item in a space affect the flow of qi by slowing it down, redirecting it or accelerating it, which is said to influence the energy level of the occupants. One use for a luopan is to detect the flow of qi. The quality of qi may rise and fall over time, feng shui with a compass might be considered a form of divination that assesses the quality of the local environment. Qìgōng (气功 or 氣功) is a practice involving coordinated breathing, movement, and awareness, traditionally viewed as a practice to cultivate and balance qi. With roots in traditional Chinese medicine, philosophy, and martial arts, qigong is now practiced worldwide for exercise, healing, meditation, and training for martial arts. Typically a qigong practice involves rhythmic breathing coordinated with slow stylized movement, a calm mindful state, and visualization of guiding qi. Qi is a didactic concept in many Chinese, Korean and Japanese martial arts. Martial qigong is a feature of both internal and external training systems in China and other East Asian cultures. The most notable of the qi-focused "internal" force (jin) martial arts are Baguazhang, Xing Yi Quan, T'ai Chi Ch'uan, Southern Praying Mantis, Snake Kung Fu, Southern Dragon Kung Fu, Aikido, Kendo, Aikijujutsu, Luohan Quan and Liu He Ba Fa. Demonstrations of qi or ki are popular in some martial arts and may include the immovable body, the unraisable body, the unbendable arm, and other feats of power. Some of these feats can alternatively be explained using biomechanics and physics. Acupuncture is a part of traditional Chinese medicine that involves insertion of needles into superficial structures of the body (skin, subcutaneous tissue, muscles) at acupuncture points to balance the flow of qi. Acupuncture is often accompanied by moxibustion, a treatment that involves burning mugwort on or near the skin at an acupuncture point. ↑ Deng, Y (2003). "Ration of Qi with Modern Essential on Traditional Chinese Medicine Qi: Qi Set, Qi Element". Journal of Mathematical Medicine (in Chinese). 16 (4): 346–347. ↑ Frantzis, Bruce Kumar (2008). The Chi Revolution: Harnessing the Healing Power of Your Life Force. Blue Snake Books. ISBN 1-58394-193-2. 1 2 3 Lee, MS; Pittler, MH; Ernst, E (2008). "Effects of Reiki in clinical practice: a systematic review of randomized clinical trials". International Journal of Clinical Practice. 62 (6): 947–54. doi:10.1111/j.1742-1241.2008.01729.x. PMID 18410352. Retrieved 2008-05-02. ↑ Porter, John A. (2003). The Tao of Star Wars. Humanics Trade Group. ISBN 978-0-89334-385-9. ↑ Sachs, Joe (2005). "Aristotle: Motion and its Place in Nature". Internet Encyclopedia of Philosophy. 1 2 3 Brian Dunning. "Your Body's Alleged Energy Fields". Skeptoid.com. Retrieved 3 September 2016. ↑ Schuessler, Axel (2007), ABC Etymological Dictionary of Old Chinese, p. 423, University of Hawaii Press. ↑ Hanyu da zidian weiyuanhui 漢語大字典委員會, eds. (1989), Hanyu Da Zidian 漢語大字典 [Comprehensive Chinese Character Dictionary], Hubei cishu chubanshe and Sichuan cishu chubanshe, vol. 3, pp. 2011-2012 (Chinese). ↑ DeFrancis, John, ed., ABC Chinese-English Comprehensive Dictionary, University of Hawaii Press, 2003, 1016, 701. ↑ Quoting Confucius that the Taiji or "Great Extreme is the primordial substance (k'í) which, moving along, divided and made two k'í; that which in itself has motion is the Yang, and that which had rest .‥ is the Yin." ↑ The essence of the ethical principle Li "is absolutely pure and good, but seeing that it is inseparable from the material element Ch'i.‥ it is from Man's birth to a greater or less extent impeded and tainted." ↑ "To the ancients the cornerstone of the theory of acupuncture, the concept whereby they explained its effects and action, was Qi, the energy of life." ↑ Deng, Y; Zhu S; Deng H (2002). "Generalized Quanta Wave with Qi on Traditional Chinese Medicine". Journal of Mathematical Medicine (in Chinese). 15 (4): 369–371. ↑ Porkert, Manfred (1974). The Theoretical Foundations of Chinese Medicine: Systems of Correspondence. MIT Press. ISBN 0-262-16058-7. OCLC 123145357. ↑ Definitions and brief historical notes on such concepts can be found in Wei Zhengtong's "Zhong Guo Zhexue Cidian", Da Lin Publishing Company, Taipei, 1977. ↑ Harper, Donald; Michael Loewe; Edward L. Shaughnessy (2007) . The Cambridge History of Ancient China: From the Origins of Civilization to 221 BC. Cambridge, U.K.: Cambridge University Press. p. 880. ISBN 978-0-521-47030-8. ↑ Denis Lawson-Wood and Joyce Lawson-Wood, Acupuncture Handbook, Health Science Press, 1964, pp. 4, 133. ↑ Lawson-Wood, p. 4 and throughout the book. ↑ Wu, Kung-tsao (2006) . Wu Family T'ai Chi Ch'uan (吳家太極拳). Chien-ch’uan T’ai-chi Ch’uan Association. ISBN 097804990X. ↑ Gu, Mingtong (2009). An Introduction to Wisdom Healing Qigong. Petaluma, CA: The Chi Center. pp. 30, 46–47. ↑ Ooi, Kean Hin (2010). . Zhineng Qigong: The science, theory and practice. CreateSpace Independent Publishing Platform. ISBN 978-1453867600. ↑ "Acupuncture: National Institutes of Health Consensus Development Conference Statement". National Institutes of Health. 3–5 November 1997. Retrieved 2007-01-15. ↑ Field, Stephen L. (1998). Qimancy: The Art and Science of Fengshui. ↑ Liang, Shou-Yu; Wen-Ching Wu, Denise Breiter-Wu (1997). Qigong Empowerment: A Guide to Medical, Taoist, Buddhist, and Wushu Energy Cultivation. Way of the Dragon Pub. ISBN 1-889659-02-9. ↑ Wile, Douglas (1995). Lost T'ai-chi Classics from the Late Ch'ing Dynasty (Chinese Philosophy and Culture). State University of New York Press. ISBN 978-0-7914-2654-8. OCLC 34546989. ↑ Bishop, Mark (1989). Okinawan Karate: Teachers, Styles and Secret Techniques. A&C Black, London. ISBN 0-7136-5666-2. OCLC 19262983. Wright, Thomas; Eisenberg, David (1995). Encounters with Qi: Exploring Chinese medicine. New York: Norton hi. ISBN 0-393-31213-5. OCLC 32998368. Porkert, Manfred (1974). The theoretical foundations of Chinese medicine: Systems of correspondence. Cambridge, Mass: MIT Press. ISBN 0-262-16058-7. OCLC 123145357. Powers, John. (1995). Introduction to Tibetan Buddhism. Ithaca, NY: Snow Lion Publications. p. 591. ISBN 1-55939-282-7.